Life is about the journey, not just the destination—or so they say—and the sight of Châteauneuf-en-Auxois perched high on a hill overlooking the Burgundy Canal demonstrates beautifully that the anticipation is often just as delightful as arriving. Visible for several kilometres as you walk along the canal, the stone turrets and fluttering flags of the château become increasingly difficult to ignore. 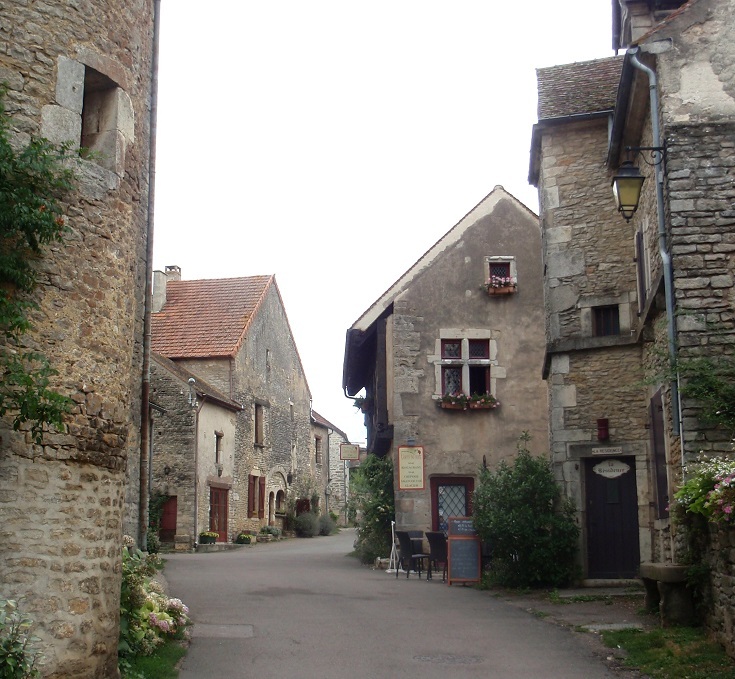 So, take the two-kilometre (1.2 mile) detour from the canal, as my walking itinerary suggests and spend the first night of the section between Pouilly-en-Auxois and Saint-Jean-de-Losne in this ‘most beautiful village’. The château was built in the twelfth century by Jean de Chaudenay as a home for his younger son Jehan—hence the name Châteauneuf, or new castle. In the fourteenth century, five towers were added and the castle was fortified to protect against invasion during the Hundred Years War. The castle stayed in the same family for nine generations until 1456 when the last heiress, Cathérine de Châteauneuf, was burnt alive as punishment for poisoning her second husband! In 1457, Philippe le Bon, Duke of Burgundy, gave the château to his advisor, Philippe Pot, whose tomb can be seen in the chapel. Over the next 450 years, the château passed through many hands until it was donated to the state in 1936. The château is open every day except Mondays and public holidays. Tours are available every hour (depending on visitor numbers) or you can pick up a brochure—available in many languages—and take a self-guided tour. When you have finished exploring the château, be sure to spend an hour or so wandering the back streets, visiting the church and enjoying the views back to the canal from the lookout. Châteauneuf-en-Auxois is 12 kilometres (7.5 miles) past Pouilly-en-Auxois, including the 2-kilometre detour from the canal to reach the village. I recommend taking the boat cruise from the port at Pouilly-en-Auxois to Vandenesse-en-Auxois – to experience the journey through the canal tunnel and several locks – and covering the last 3 kilometres on foot. 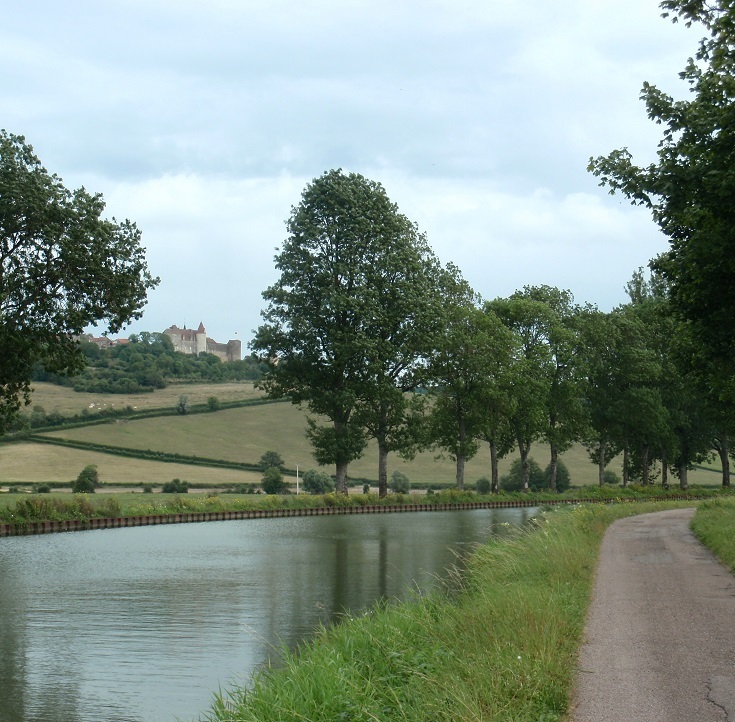 To reach Châteauneuf-en-Auxois from the Burgundy Canal – cross the canal at the first bridge after Écluse 10 S la Mine and follow this road up the hill for 1.2 kilometres (0.8 miles) until it meets the D18A. Turn left and continue for another 200 metres into the village. There is no Tourist Office in Châteauneuf-en-Auxois but you’ll find lots of useful information about what’s happening in the village on this website. There are several cafés in Châteauneuf-en-Auxois where you can stop for lunch or dinner, but unfortunately no bakery or supermarket where you can stock up on trail mix and other supplies. Personally recommended: Hostellerie du Château where the food is so good, I worked my way through much of the menu over three consecutive nights!